The Kiev-appointed governor of Lugansk region plans to cut all road transport between Ukraine and the self-proclaimed Lugansk People’s Republic. On Friday, almost 170 freight trucks were prevented from crossing the border. “Soon any crossings of the disengagement line [between areas controlled by the Ukrainian government and the rebels] for transport, including cars, will be cut. All motorways will be blocked. An exception would be made only for pedestrians,” said a statement published on Gennady Moskal’s website. 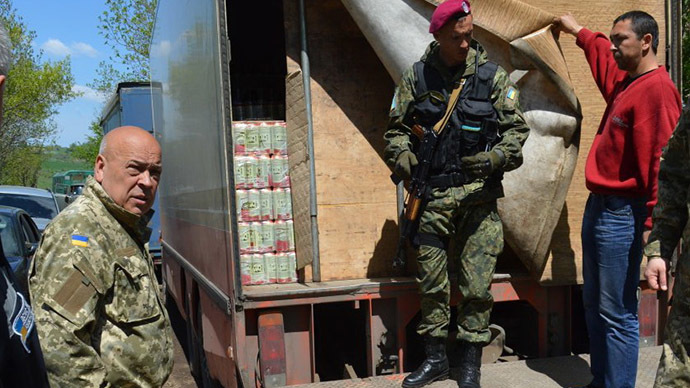 Moskal, who was appointed as the head of “civilian-military administration” of the Lugansk region by Kiev, was reporting the seizure of two trucks, which were “illegally” transporting beer to the rebel-held areas. A video of the episode was published on YouTube. “But it’s all Ukraine. Nobody declared martial law here,” the driver argues. “I banned everything from crossing except cars and pedestrians. And starting 12th there would be only pedestrians. Because of the likes of you,” the governor replies. Earlier on Friday 168 freighter vehicles were prevented from going across the disengagement line by the Ukrainian authorities Moskal’s administration said they were going to smuggle goods to the rebels with the help of corrupt Ukrainian military. In November 2014, Ukrainian President Petro Poroshenko ordered that all bank services be halted for the rebel-controlled areas. The move effectively made impossible many business transactions between those areas and the part of Ukraine remaining under the government’s control. In the dissenting areas it was viewed as an attempt to strangle the rebellion economically after a failure to do it through military force. The blockade is meant to be canceled as part of the Minsk agreement, a peace roadmap brokered in February by France, Germany, Russia and Ukraine in the Belarusian capital, Minsk. There was a scaling down the level of violence in eastern Ukraine since then, but little progress in finding a long-term solution that would restore peace in Ukraine.